Doctors working in community care have a poor understanding of hypertension, a new survey shows, highlighting the need for continuing professional education for medical practitioners. 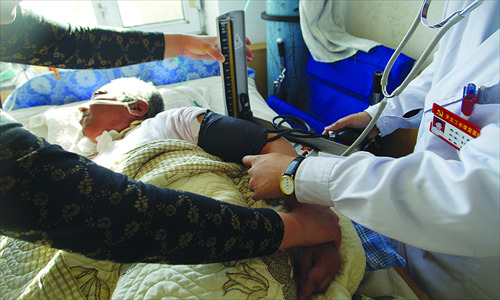 A survey carried out by Dr Qian Chen of the General Practice Department, Zhongshan Hospital, Fudan University, found that doctors had an inadequate understanding of the diagnosis, treatment, referral and community management of hypertension. The average score on a hypertension skills test was less than 50%, and knowledge varied with the age and training background of doctors, with some practitioners scoring as low as 10%. The results came from a survey of 150 community-based medical practitioners in Shanghai, who were given questions based on China's evdience-based hypertension management guidelines. healthcare center. Almost 90% of physicians reported being willing to attend training courses regularly and the preferred frequency was once every two to three months. aware of and adhere to hypertension prevention and treatment strategies," they say.Increasing GPs’ awareness and understanding of hypertension prevention and treatment is necessary to reduce the prevalence of hypertension in China," they conclude.